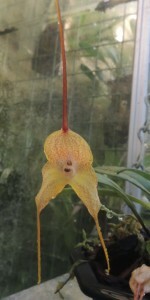 Another Masdevallia for you today. Masdevallia triangularis is a striking small plant with relatively large flowers that are kind of triangular. The flower has lovely red/orange spots and long straight tails. The species comes from Venuela, Colombia, Ecuador and Peru and with such a wide distribution it is not surprising that the species is quite variable with colours from yellow through to dark orange.